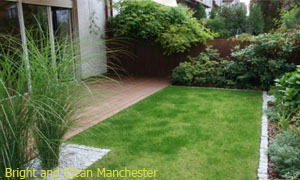 Use us for all of your gardening in Manchester. Or just for the bits you don’t enjoy. Whatever stage your garden is at we’ll take it forward. Book us for your lawn care and grass cutting. 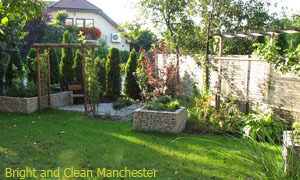 Arrange a one-off garden clearance service or set up weekly or monthly garden maintenance. There’s lots of flexibility built into our gardening services. In fact the only thing that’s fixed is the standard of our workmanship. That’s high and non-negotiable. Contact us 24/7: Call, use our chat facility or fill in our contact form: Find our hourly rates or set up a no-obligation quote for extensive work. Set up an onsite evaluation: Take all the time you need to tell an expert gardener about the garden you yearn for. Save money and space: Our gardeners bring all their own tools and equipment, so you don’t have to buy or store things you rarely use. Arrange gardening seven days a week: At no extra cost for weekends, and our gardeners will come even in bad weather. Book environmentally-friendly gardeners: For chemical free gardens, wildlife havens or plan for low water usage. Use us for gardening and for cleaning too: Book jet washing, domestic cleaning or other services and you may pay a reduced total rate. Lawn care: Cutting, edging, watering, feeding, top dressing, aerating and scarification. We’ll also perform seasonal lawn-care tasks as needed. There’s a lot that goes into keeping grass green and lush. We have all the tools needed and the expertise required to use them to their best effect. Garden Maintenance: Get us to plant your veggies, lay out your annual bedding .or prune your roses. Ask us to plan for year round colour, organise a corner for the kids to call their own, or just do the weeding. Our team members are all reference and CRB vetted before starting work. They’ll arrive on time, in uniform, carrying ID and all of their services are provided under comprehensive insurance. As well as being trustworthy and reliable our gardeners are all skilled and experienced horticulturists. You’ll find them to be courteous, friendly and very happy to share their knowledge and expertise with you.